The 4th Horseman is a goth themed bar and restaurant that has recently opened its doors on Fourth Street in Downtown Long Beach. Immediately upon entering, you are greeted by a red glowing neon sign that reads “eat beer, drink pizza”. Vintage arcade games line the wall and sets the tone for the 4th Horseman’s classic yet spooky ambiance. As one could guess from the sign, The 4th Horseman specializes in artisan pizza and beer. In fact, the only things they sell. The pizzas are around $20 and are large enough to be shared between 2 to 3 people. Regardless, the menu doesn’t feel too limited. They have classics like pepperoni pizza, which they have named “Slasher”, and a more abstract Korean influenced pizza called “Memento Mori”. Every single item on the menu has a name inspired by a horror themed pop culture reference including, Rosemary’s Baby”, a pizza with italian sausage and balsamic mushrooms, and “Buffalo Bill”, a chicken, chive and buffalo sauce pizza. The same concept goes for their craft beer with names like “la fin du monde”, (translation: the end of the world). For The 4th Horseman, the devil's in the details. What makes this place so remarkable is its macabre decor. Posters and artwork inspired by classic horror movies fill the room. The tables are decorated with vintage comics. There is a projector playing scary movies on a loop. 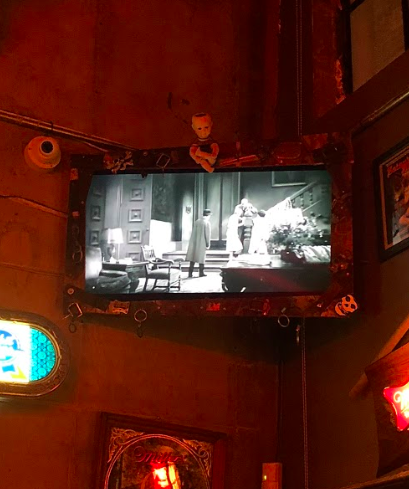 Every inch of the bar is covered in some sort of horror inspired memorabilia. Even the bathroom feels like a maze out of Knotts Scary Farm. A chandelier with red lightbulbs and a speaker filling the room with heavy metal music tops off the already ominous atmosphere. At its core, The 4th Horseman is a sinister love letter to classic horror cinema. Even if you are not a horror movie aficionado, you can appreciate The 4th Horseman’s food and aesthetic. The 4th Horseman opens at 3 p.m. during the week and noon on weekends and is located at 121 W. Fourth St., Long Beach. Visit their website for more information.